TOKYO -- The issue of ethnic Rohingya refugees is an international problem and not ASEAN's alone, said Prime Minister Datuk Seri Najib Tun Razak. 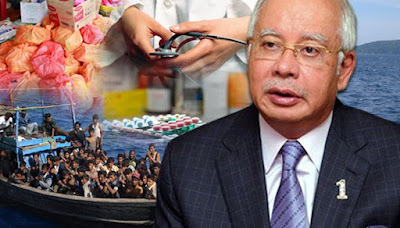 Najib said while Malaysia and its neighbours tried to look for an ASEAN solution, the issue of Rohingya boat people was also an international problem that required international solution. "I took the opportunity to brief Prime Minister (Shinzo) Abe on the latest challenge faced by Malaysia and ASEAN. Anything Japan can do to help us to alleviate this problem, is very much welcomed," he said. Najib was speaking at a joint press conference with his counterpart Shinzo Abe after their bilateral meeting at the Prime Minister's Office, here. Kedah has been facing a flood of illegal Rohingya and Bangladeshi immigrants since two weeks ago when 1,158 of the aliens were arrested after landing in Langkawi on May 11. The landing took place when Thailand conducted large-scale operations to combat human trafficking by syndicates after finding more than 30 bodies in a mass grave in the south of the country, early this month. Malaysia and Indonesia have agreed to provide temporary shelter for the 7,000 illegals who are believed to be still in international waters, nearby. In the joint statement issued after their bilateral meeting, both leaders said they acknowledged the dire humanitarian circumstances with regard to the Rohingya issue. Abe said he welcomed the efforts made by Malaysia in reaching the agreement with Indonesia to provide temporary shelter to the refugees provided that the resettlement and repatriation process would be done in one year by the international community.